As 2016 progresses, we continue on a downward descent into Gas Glut II. But how does this impact European hub price dynamics? The global gas market fell into a supply glut in 2009-10. The financial crisis, new LNG projects and an explosion of US shale gas production conspired to knock the market out of balance. But this supply glut was relatively short lived. Strong demand growth in Asia, particularly after the Fukushima accident in 2011, saw a rapid recovery from oversupply. As 2016 progresses, we continue on a downward descent into a new phase of global oversupply and price convergence. Any suggestion that these conditions are just a temporary phenomenon has been dispelled by plunging prices across the first 6 weeks of this year. Sharp price falls make flashy headlines. But behind this there is an interesting shift in the factors which drive hub price dynamics. We take a look at these in today’s article. We regularly update our global gas price chart to maintain a view of European hub prices in a broader context. We last published this chart in early December 2015. But there have been some major market moves in the meantime. Chart 1 shows a current snapshot of global price benchmarks. This situation foreshadows the likelihood of further hub price declines into the summer. As the impact of 30 $/bbl oil feeds through into contract prices, these will start to form strong overhead price resistance in the 5-6 $/mmbtu range. This can be more clearly seen in Chart 2 which shows a magnified near term horizon view of Chart 1. With hub prices below this level, contract buyers have an incentive to minimise volumes at ‘take or pay’ levels. Contract ‘swing’ volumes above take or pay then act as an overhang that helps dampen any recovery in hub prices. These dynamics can be more clearly seen in Chart 2 which shows a magnified near term horizon view of Chart 1. Almost 50 bcma of new LNG liquefaction capacity is expected to be commissioned between Q4 2015 and Q4 2016. This includes the three Gladstone LNG projects in Queensland and trains 1 & 2 of the giant Gorgon project in Western Australia. As these volumes ramp up in earnest this year, they will translate into higher European LNG import volumes. LNG importers will be competing against storage capacity owners to sell gas at European hubs. As February progresses the chance of a cold snap diminishes. This can cause a ‘rush for the exit’ as storage inventories are withdrawn across the tail of winter, to allow capacity owners to refill with the onset of summer. Chart 2 illustrates that so far in 2016, hub prices have been falling faster than long term contract prices. This is consistent with the fact that we are now beyond the ‘tipping point’ we foreshadowed last year. 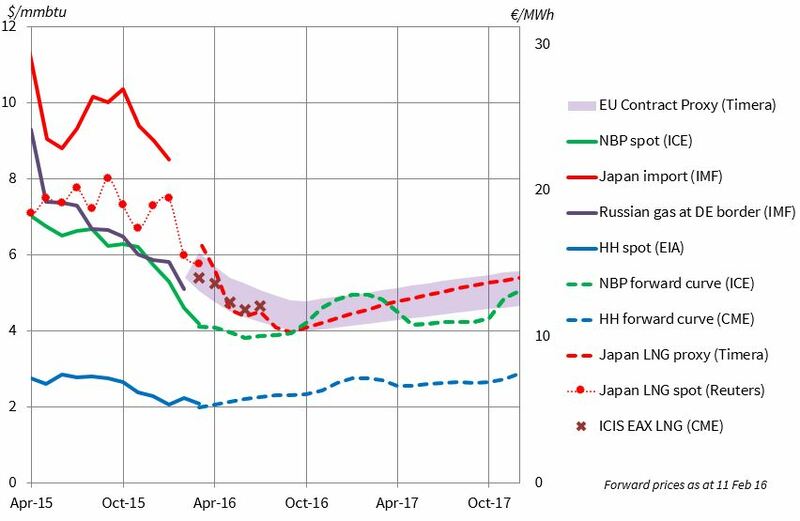 Oil-indexed contract prices are no longer the dominant price setter at European hubs given pressure from LNG imports and storage withdrawals. That sets up an important shift in hub pricing dynamics going forward. While the rate and timing of hub price declines is far from certain, the lower price bound is very clear. If European hubs are unable to swallow the growing oversupply of LNG, then Henry Hub will need to join the party. NBP and Henry Hub convergence was a common condition later last decade. During the commodity supercycle boom, a perceived shortage of gas at Henry Hub helped to push European hub prices higher. This effect was then reversed as oversupply took hold in 2009 with the US absorbing surplus gas. US vs European hub price convergence typically occurs on a range basis rather than an absolute basis. The current spot price spread of NBP over Henry Hub is about 2 $/mmbtu. But as that gap narrows to below 1.0 $/mmbtu it should start to choke off LNG supply to Europe. The current trans-Atlantic variable shipping cost differential is between 0.5-1.0 $/mmbtu (accounting for regas costs). Price convergence below this level is important for the new US export project at Sabine Pass as it may mean exports are ‘shut in’. But it also impacts flow decisions from other existing LNG exporters in the Atlantic Basin (e.g. South America and West Africa). It would not surprise us to see the Henry Hub and NBP spread test the Atlantic shipping cost differential range over the next 12 months. But rather than a steady relationship, US vs European price convergence may be quite a dynamic affair (think Richard Burton vs Elizabeth Taylor), which fluctuates according to prevailing market conditions. 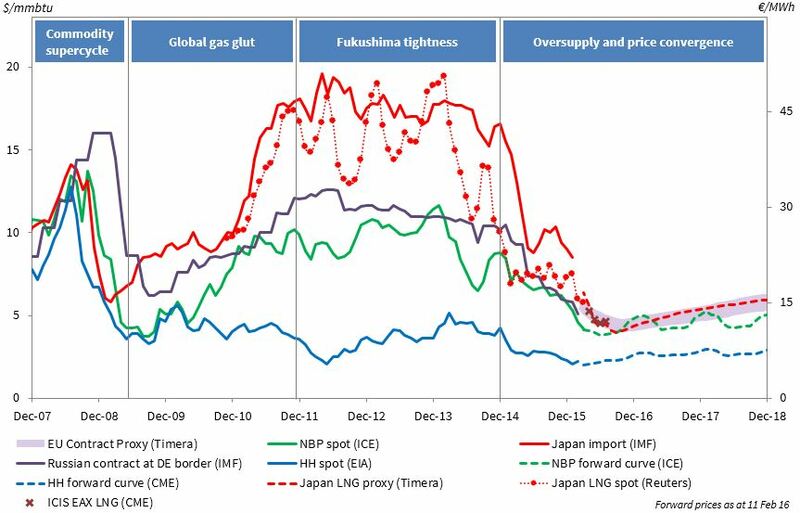 Oversupply and trans-Atlantic convergence also introduce another interesting dynamic: the potential divergence of European gas hub prices from oil-indexed contract prices. A more prolonged period of divergence could spell a major disruption for European suppliers and their key producer (Gazprom). But that topic is worthy of a separate article to follow.